We think this topic is so important, it merits a part two! The previous article discussed key factors you should consider when pricing your freelance service. The current article emphasizes the rest of the things you should consider when deciding the correct price tag. Basically, there are three main things to consider when determining the cost of the respective service you offer. Determine the amount of money you should spend on the supplies in order to complete the undertaken project. For an example, if you need to purchase specific software, download stock images or subscribe any service, consider them as costs. The number of hours you spend, hourly rate, and the total salary you would pay yourself to complete the entire project should be counted in this case. No matter whether you work from own house, you should apply a fraction of the cost of it to the total project cost. In fact, what you need to count is the predetermined overhead rate (total overhead costs divided by the number of hours you intend to work per year). This particular cost should be determined at the beginning of the financial year. The amount might not be precise, but the key is to cover up at least some of your overheads with the income you generate via freelancer work. Now that you know the amounts you should consider as the overall project cost, it will be quite easy for you to determine the price of the service you are going to offer. Knowing the overall project cost is the key to move in to this step. If you intend to make a profit from your freelance work, you cannot be satisfied just by charging the breakeven amount from the client. Instead, you need to add a certain profit margin to the overall cost and present it as the ‘price’ of the project. Now, you need to carefully observe the amount your competitors charge for their services. After knowing your price (inclusive of profit margin) and what the competitors charge, it is up to you to decide the exact amount chargeable amount. It is always important to keep a profitable price; at the initial stage, however, the prominence should be given to stay in the competition with a competitive price. Always be flexible to negotiations. If a particular competitor offers a price which is lower even than your costs, you may have to find some way to reduce the costs. On the other hand, if you come up with a very high price than the average market price, you must have to justify why your clients pay more and obtain your services. 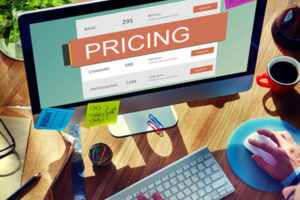 At the initial stage, you will not be able to directly jump into the intended price range unless you offer a very unique service that has very less competitors. Keep concentrating on building your portfolio and move ahead towards the target strategically.